Size: 704 sq.ft. - 2727 sq.ft. Emaar Group has delivered numerous unique styled projects whether it is residential or commercial. 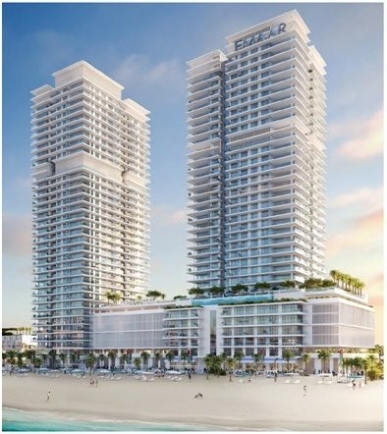 This time the Emaar Developer has come with the latest beachfront residential towers known as "Sunrise Bay". Sunrise Bay is located at the intersections of JBR & Dubai Marina in the heart of Dubai Harbour. It is a twin tower development stands 26 Storey high where the residents of Sunrise Bay can access all leisure amenities that include retail centres, shopping mall, yacht club and hotels. These spacious fully furnished 1 BR to 4 BR apartments allows inhabitants to enjoy 750 meters of sandy beach. Sunrise Bay homes will be delivered by October, 2021. After successfully selling Emaar "Beach Vista" - the first development in this community Emaar Group has planned to present new residential towers The Sunrise Bay. The Sunrise Bay project is a home to luxurious 215 residential units with a choice of stylish 1, 2, 3, and 4 bedroom apartments. Residents can access top-notch facilities and recreational spaces in a magnificent beachfront community. These two towers of Sunrise Bay are well-networked through podium deck, world-class sports facilities, private parking, several retail and healthcare amenities at the ground level. The apartments range from 670 sq.ft. for 1 BR homes and 2,727 sq.ft. for 4 BR residences. Each apartment features a wraparound balcony which boasts panoramic views of the surrounding heavenly beach and glistening ocean. Emaar Properties is world’s reputed master developer established in 1997. With proven expertise in various competencies like residential, retail, hospitality and leisure Emaar Group has established its brand as the pioneer for master planned communities and has also kept a good track record of creating superior quality homes and establishments. Being the group that built the world’s tallest tower Burj Khalifa, Emaar has gained popularity not only in the United Arab Emirates (UAE) but also in different parts of the world. The developer is also known for its high quality residences and office spaces located in its key master developments. This is the second Beachfront residential apartment project to be launched in Dubai Harbour. The Dubai Harbour is a 20 Million square feet development by Meraas Holding. The location of Sunrise Bay is positioned in one of the city’s much-desired waterfront districts neighbouring the Jumeirah Beach Residences and the Palm Jumeirah. The residents of Sunrise Bay Emaar Beachfront will have direct access to their homes in Dubai Harbour either from King Salman bin Abdulaziz Al Saud Street a bridge that connects them directly from Sheikh Zayed Road or the monorail system that will link to the metro from both Palm Jumeirah and Bluewaters Island.Dubai Harbour is sprawled over 20 million sq. feet that include a 1400-berth marina as well as a cruise ship port and terminal, a shopping mall covering 3.5 million sq. feet. Sunrise Bay at Emaar Beachfront is an exclusive residential community located at Al Sufouh Road, Dubai Harbour, Dubai, UAE. Emaar Sunrise Bay retains a family-friendly atmosphere with access to 750 meters of sandy beach, a vibrant boulevard at their doorstep, finest restaurants, retail outlets, chic cafés, wide array of gastronomic choices and urban entertainment,Concierge service, Doorman, Gymnasium, High-speed internet, Infinity Pool, Reception service, Residents lounge area, Retail area, Valet parking and many more features. 696 sq.ft. - 2358 sq.ft. 655 sq.ft. - 2450 sq.ft.